That’s how the song goes, yeah? Well if not it should be! 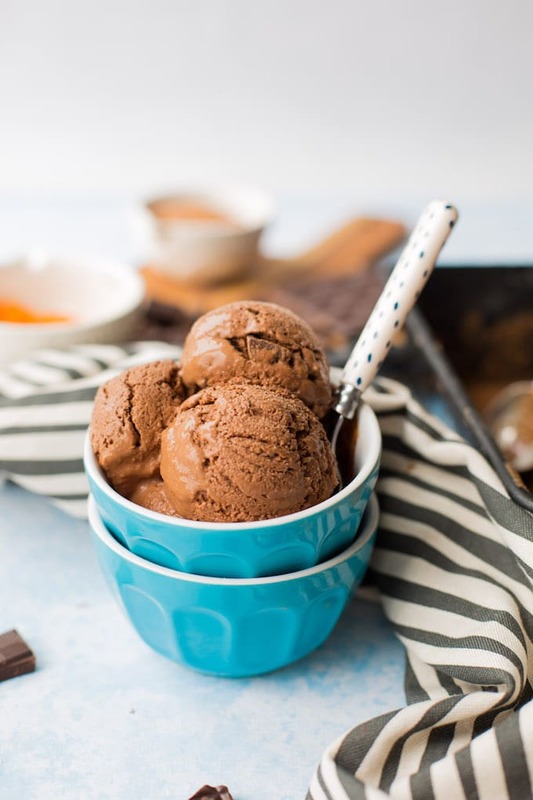 This ice cream is all kinds of rich, creamy & crazy delicious! 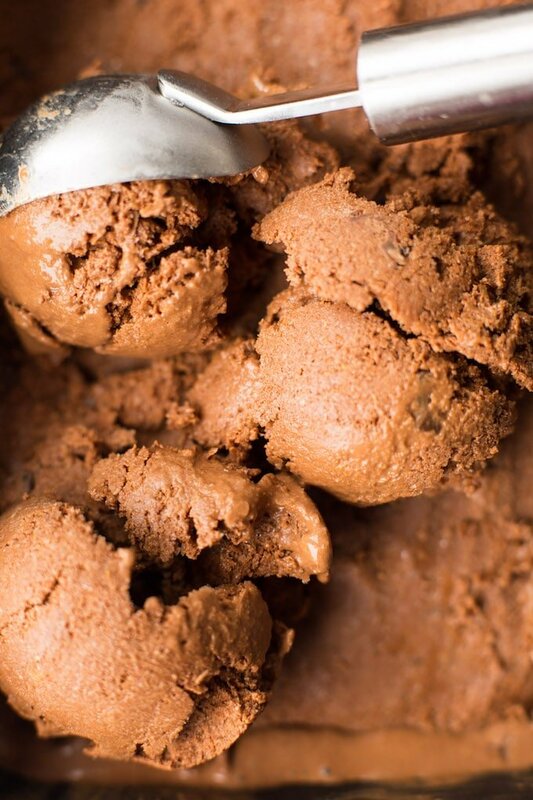 So get out your blenders, friends – we’re making ice cream! 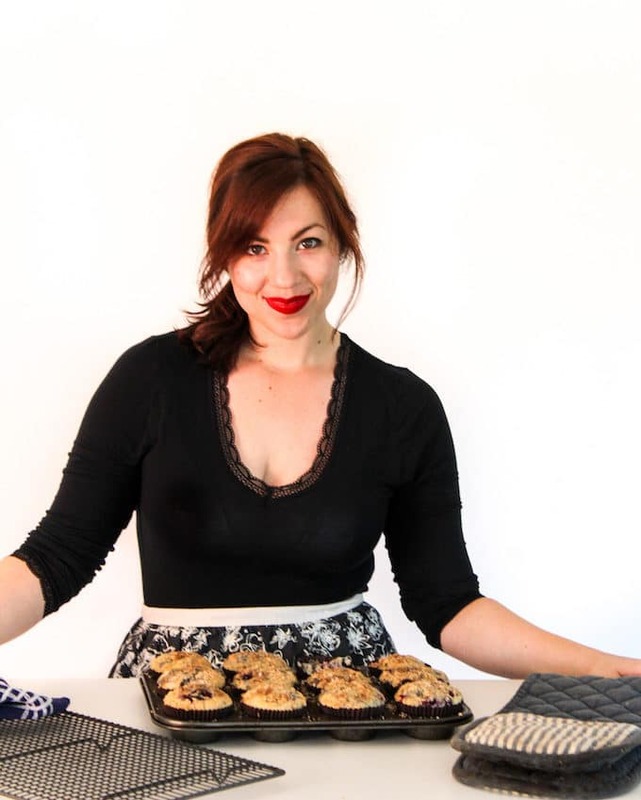 This recipe is incredibly easy requiring just 5 ingredients and a blender. Just blitz these all up in a blender until smooth. Easy! Good question! We’ve made a lot of coconut milk based ice creams over the years. While they are delicious and easy to make they’re not always as creamy as I’d like them to be. That’s why so many paleo/vegan ice creams like my Chocolate Orange Ice Cream also have nut butters or soaked cashews thrown into the mix. The thing is I really wanted to create a nut free recipe for Mike. He’s been avoiding nuts for the past few weeks to see if the inflammation in his hands goes down and so far it looks promising. After a bit of brainstorming we came up with two options: bananas and sweet potato. Bananas can also help somewhat with ice cream, but the problem with using those is that your ice cream will then largely taste of banana. Not really my thing. Sweet potato on the other hand turned out to be a perfect idea! It’s adds richness and creaminess while not imparting much flavour to take away from the chocolate! Bliss. It’s also one of the few ways I can get my husband to eat sweet potato. It may be mixed in with chocolate but I’ll still take that as a small victory. 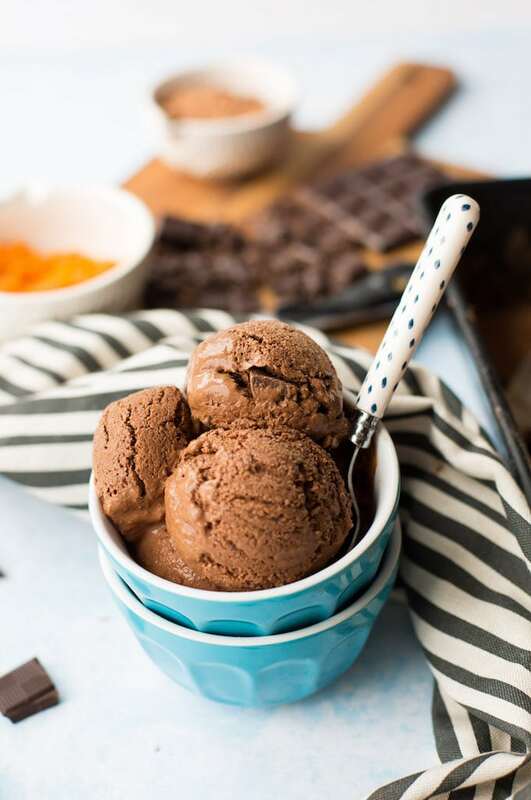 For an even more decadent chocolate ice cream experience you can also mix in a few broken brownie pieces halfway through the freezing process. I had some leftover paleo brownies hiding out in the freezer that made their way into a bowl of ice cream one night. SO good! You can also serve these inside a homemade chocolate bowl if you want to really impress your people. Chocolate on top of chocolate inside more chocolate…..now that’s how you have a good time! 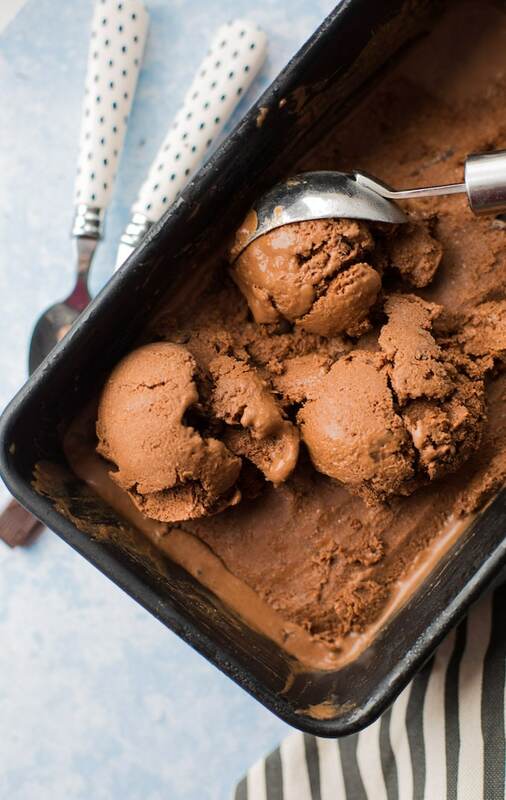 Don’t forget to #asaucykitchen on instagram if you try this Chocolate Coconut Milk Ice Cream! We love seeing what you make! You can also post your pictures to my facebook page – those are always fun to see! Pour the mixture into to a medium loaf pan and cover. Transfer to the freezer and allow to freeze at least 6 hours or overnight. Let thaw on the counter top at least 15-20 minutes before scooping and serving. Enjoy! Prep time is 5 minutes but freeze time is at least 6 hours. Let thaw on the counter top for 15-20 minutes before serving. Hello! I have a question about the chocolate ice cream. Does it have to be chocolate? Can it be altered to be raspberry or something. I don’t eat chocolate but I would love to try this in a different flavour. Hi Jennifer! I haven’t tried this with other flavours yet but it’s something I want to work on. I do think it would work well with more fruity flavours but I’m not sure about the amounts yet. Since fruit has a lot of water it has the tendency to make dairy free ice creams really icy. 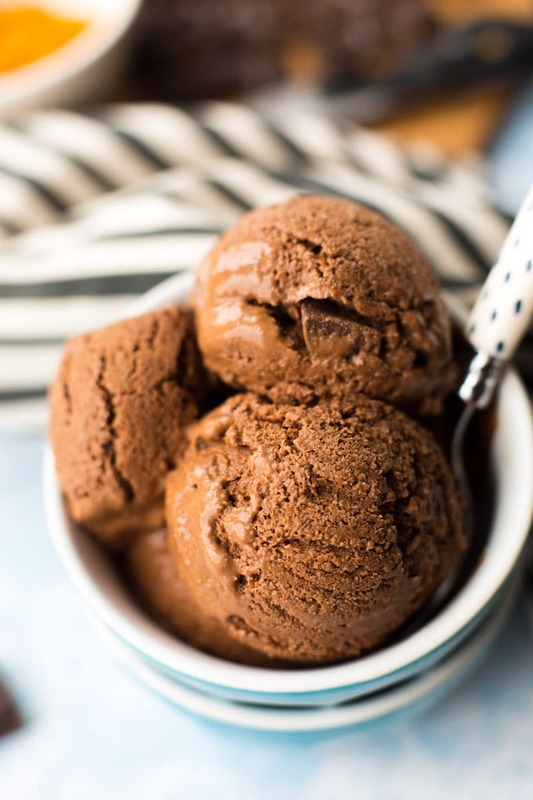 Have you ever tried making this in an ice cream maker, instead of freezing in a pan? Can I use Silk Milk Soy Milk instead of Canned coconut Milk? Hi Joanne! It would kind of work but the texture would be a lot more icy and not very creamy like it would with a full fat milk. Just a heads up, I almost skipped this when I read “coconut powder” near the top, since I don’t have that, but kept scrolling and saw “cocoa powder” instead! I think I’ll try it! Whoops! Thanks for pointing that out to me! Great recipe! I substituted avocado for the sweet potato and it was amazing! You used a whole avocado or half? Thx! Just made the ice cream. Can’t wait for my girls to taste it tonight. Can you supply the calorie and carb count on this? I’m in love…it’s delicious. I didn’t use the coconut sugar, rather using an approved substitute. Swerve the first time. Second time gentle sweet. I love having an ice cream. Hi Deb! SO glad you liked it! With Swerve this comes out to 192 calories/23 grams of carbs per serving. With Gentle Sweet it’s 214 calories/23 grams of carbs. Hope that helps! Can you make this without the sweet potatoe for a keto version? You can do it without sweet potato but it won’t be quite as creamy. You could also use almond butter in place of sweet potato if you wanted! I haven’t tried it myself, but I have seen a couple paleo/vegan ice creams that used boiled & mashed cauliflower. I’m trying this. Our electric ice cream maker just died but our weather is still hot..need non-dairy ice cream! And 2 cans of full fat coconut milk is fat with water coconut?? Hi Eva! The sweet potato is cooked – you can either roast it in the oven at 425F for about 40 minutes until soft or just poke a few holes in the potatoes and cook them in the microwave for 5 minutes until soft. After you let them cool the peel comes off easily and you can just mash it with a fork. The full fat coconut milk is a combo of coconut cream and coconut water so it should be nice and thick. Hope that helps! I made this yesterday and tried it this evening. Oh my, I am in heaven because I finally found an ice cream to rival the Baskin Robbins dark chocolate almond ice cream that they no longer make. I just threw in a couple of chunks of almonds into a bowl of this ice cream and voila! Since I am dairy intolerant, this is the perfect replacement. Thank you so much for this recipe!!!!!! Yay! That makes me so happy to hear! Love the addition of almonds – I like adding extra chocolate chunks in mine for the added crunch. Almonds sounds lovely! Thanks so much for coming back to leave a comment/review! To be honest it’s been a long time since I’ve eaten normal dairy ice cream – I don’t do well with too much dairy or soy so I end up eating mostly just coconut milk based ice creams. There are some ice creams (like plain vanilla coconut milk) that I don’t really care for because it’s too coconut-y. I may just be used to the flavour by now, but I don’t think the coconut flavour is too over powering here. You will probably taste some, but the main taste is chocolate. Hope that helps! YASSSSS to the creaminess of this ice cream! I love the idea of adding sweet potato for even more creaminess and sweetness!